Cristina Guzman-Moumtiz, a second-year double major in biomedical engineering and biotechnology and molecular bioscience from New York City, showcased her three-week trip to Guatemala for her Engineering World Health course at the Global Learning Symposium on April 5. When a hospital in Mazatenango, Guatemala, faced a backup on surgeries due to broken medical equipment this spring, Rochester Institute of Technology students including Cristina Guzman-Moumtiz came to the rescue. She helped diagnose and repair about 30 pieces of hospital equipment including electrosurgical units over a three-week trip to Guatemala for her Engineering World Health course. This project was one of 13 on display at the fourth annual Global Learning Symposium on April 5. The event, which took place in the University Gallery, highlighted RIT students’ study, research and work abroad achievements throughout the academic year. More than 400 RIT students engage in global learning experiences each year, often aided by study abroad scholarships and international fellowships. Guzman-Moumtiz, a tinkerer by nature who is always looking for ways to apply her engineering skills, was thrilled to have an opportunity to gain college credit while doing philanthropic work. Fourth-year students John Keefe (new media design) and Reuben Van Hoeve (film and animation) showcased their experience in the RIT Kosovo summer program in peacebuilding, post-conflict resolution and development. The program focuses the history, politics and economics of conflict situations in an environment that serves as a living example of the subject. 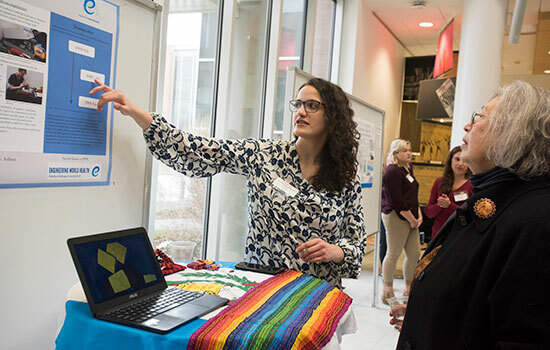 A cross-disciplinary team of students led by interior design program chair and Assistant Professor Mary Golden demonstrated capstone projects focused on healthcare improvements for Honduras. Some of the products developed following a research trip to the country in October included an intra-hospital neonatal ambulance, an emergency incubator resuscitation kit and a skin-to-skin incubation device. To learn more about RIT’s study, work and research abroad programs, go to http://studyabroad.rit.edu or email global@rit.edu.